From left, Stephanie Gardner, Pharm.D., Ed.D. ; senior vice chancellor for academic affairs and provost; Chancellor Dan Rahn, M.D. ; David Wroten, executive vice president of the Arkansas Medical Society; Amy B. Cahill, M.D., Arkansas Medical Society president; Kent Westbrook, M.D., distinguished professor of surgery in the College of Medicine; and Jack Blackshear, M.D., chair of the endowment steering committee, congratulate Pope L. Moseley, M.D., dean of the College of Medicine and executive vice chancellor at the UAMS, after he is named the inaugural recipient of the Arkansas Medical Society Distinguished Dean’s Chair. June 12, 2017 | June 12, 2017 | Pope L. Moseley, M.D., dean of the College of Medicine and executive vice chancellor at the University of Arkansas for Medical Sciences (UAMS), was formally invested June 8 as the inaugural recipient of the Arkansas Medical Society Distinguished Dean’s Chair. Moseley, a leader in internal medicine and internationally recognized physician-scientist, came to UAMS in July 2015. He oversees the college’s interrelated missions to train the next generation of Arkansas’ physicians, develop new knowledge that leads to better health, and deliver world-class, patient-centered care. The college is the largest at UAMS and home to about three-fourths of the faculty, many of whom also serve in UAMS’ Graduate School, institutes and other units. An endowed distinguished chair is the among the highest academic honors a university can bestow on a faculty member and is established with gifts of $1.5 million, which are invested and the proceeds used to support the educational, research and clinical activities of the chair holder and college. Those named to a distinguished chair are among the most highly regarded scientists, physicians and educators in their fields of expertise. Pope L. Moseley, M.D., speaks at the investiture ceremony. Moseley was presented with a commemorative medallion by Rahn and Stephanie Gardner, Pharm.D., Ed.D., senior vice chancellor for academic affairs and provost. 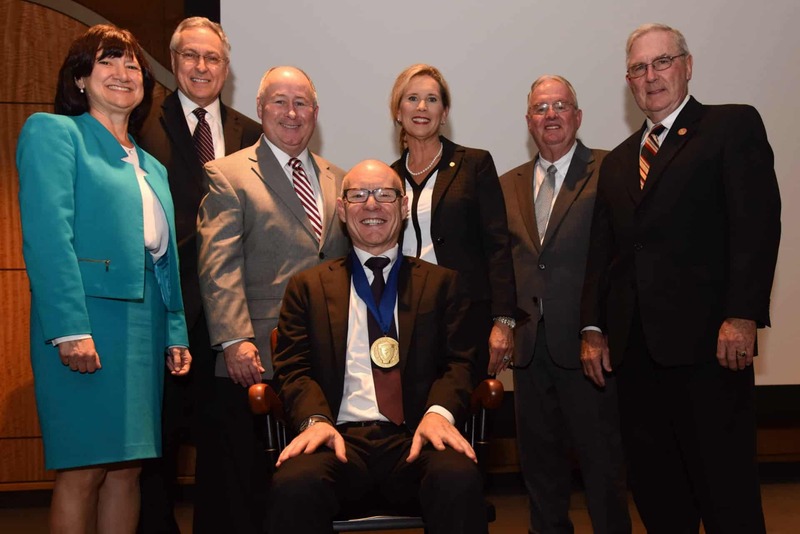 “This is a great personal honor to be the holder of the first Arkansas Medical Society Distinguished Dean’s Chair,” said Moseley. “The chair is really not about me, though, it’s about the position. I am most grateful that it has been established because of what it means for the College of Medicine and those we serve. I’m grateful because it’s what we as the college can do to work with the medical society to create value in our medical system. The UAMS College of Medicine and the Arkansas Medical Society share common roots extending to the 1870s and an ongoing commitment to improve health care in Arkansas through education, training and support for the very best physicians. By establishing a distinguished chair for the college’s most important leadership post, the society is making a transformative investment that will benefit Arkansas’ future physicians – and their future patients – in perpetuity. Arkansas Medical Society President Amy B. Cahill, M.D., a 1995 UAMS graduate, noted that the doctors who originally started the College of Medicine were also members of the medical society. Moseley’s special guest speaker at the event was Matthew L. Cotten, Ph.D., of the Department of Viroscience at the Erasmus University Medical Centre at Rotterdam in the Netherlands and a researcher in virus genomics at the Wellcome Trust Sanger Institute in Hinxton, Cambridge, U.K. Cotten and Moseley started working together at the University of Iowa in 1984 and co-authored an article that appeared in Nature in 2000. Moseley came to UAMS from the University of New Mexico (UNM) School of Medicine, where he was a distinguished professor and led the Department of Internal Medicine as its chair for 14 years. He is highly regarded both for his laboratory research focusing on cellular adaptations to exercise and for his expertise in disease systems biology. As an associate director of UNM’s Clinical Translational Science Center, which is funded by the National Institutes of Health, Moseley led comparative effectiveness research initiatives and oversaw development of the UNM Health Sciences Center informatics platform. Among many initiatives at UAMS, Moseley has launched a major initiative to develop a top-tier biomedical informatics program. The rapidly growing field focuses on the design and use of sophisticated computational tools to manage and assess massive sets of medical and public health information to drive research and improve clinical care and health. In addition, Moseley continues to oversee graduate students at the University of Copenhagen, in the Systems Biology Group of the Center for Protein Research, where they are developing an informatics approach to uncovering disease associations using the Danish National Health Registry. Moseley received his undergraduate degree from Davidson College, his medical degree from the University of Illinois College of Medicine and a master’s degree in preventive medicine and environmental health at the University of Iowa. 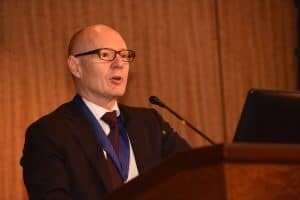 He completed a residency in internal medicine and occupational medicine and a fellowship in pulmonary and critical care medicine at the University of Iowa. He is certified by the American Board of Internal Medicine, the American Board of Preventive Medicine (specialty in occupational medicine), and by the subspecialty board in pulmonary diseases. Moseley was recruited to New Mexico in 1995 and served as chief of pulmonary/critical care and as senior associate dean for research prior to his appointment as chair of internal medicine. He also held the Reva S. Skelton Research Endowment and was a Regents’ Professor of the University. The Arkansas Medical Society was created by and for physicians in 1875 and is now one of the most respected and influential health care organizations in Arkansas. The society is dedicated to improving health care in Arkansas and helping physicians focus on caring for their patients. It serves as an advocate, support system and source for health care news and resources.